Littleton albums are an economical, safe way to store, protect and view your collection. Littleton albums come in many configurations, allowing you to collect in series or sets, or put together your own custom set. Littleton pages are made of inert materials, with anti-corrosion technology, so Littleton pages won't damage your collection and are safe for long-term storage. If an additional degree of protection is needed, simply purchase a Littleton slipcase with anti-corrosion technology to further protect your collection from the elements. Littleton albums are available for nearly every U.S. coin series and many foreign coin series. Want to step outside the collector's box and create your own set? 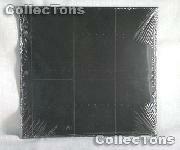 Littleton albums are also available as blank albums with blank or labeled pages so you can collect your way. Additionally, Littleton pages are available in a standard 2x2 holder configuration, allowing you to quickly store your 2x2 coin collections in a Littleton album. Unlike most collector's albums, Littleton albums are constructed as 3-ring binders, allowing the albums to lay flat when open. 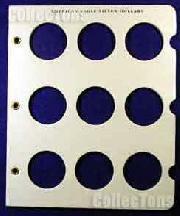 Littleton Albums are made in the U.S.A.
Includes extra ports for varieties. Series information and mintage figures included. 3 Flying Eagle cent ports, 56 Indian Head cent ports. Includes 1864L, 1886 Variety I & II, 1908S, 1909S. Series information and mintage figures included. 140 dated ports, 10 extra ports. Series information and mintage figures included. Labeled to 2008 with 20 blank ports. Includes ports for 1960, 1970 Large and Small Date varieties, and Proof issues. Series information and mintage figures included. Includes 1883 "No Cents" and "With Cents" varieties, plus 1912-D and-S. Series information and mintage figures included. Includes 1913 Raised Ground varieties plus extra spaces for varieties. Series information and mintage figures included. 5 blank ports. Series information and mintage figures included. Includes Proof issues. Series information and mintage figures included. Includes 1 blank port. Series information and mintage figures included. Labeled to 2010 with 38 blank ports. Series information and mintage figures included. 74 dated ports and 16 undated ports. Series information and mintage figures included. Includes key 1942 2 over 1 and 1945-S Micro S issues. Series information and mintage figures included. Labeled to 2007, with 21 blank ports. Includes Proof and Silver Proofs and extra ports for varieties. Series information and mintage figures included. 24 dated ports and 12 undated ports. Series information and mintage figures included. Includes extra spaces for varieties. Series information and mintage figures included. Includes all 1917 varieties. Series information and mintage figures included. Includes ports for Bicentennial and Proof issues. Series information and mintage figures included. Includes ports for Silver Proof issues. Series and individual state information included. * Littleton D.C. and Territories Update Pages 6 & 7 for Littleton State Quarters 2004-2008 w/ Proof Album LCA18. Page 6 holds the P, D, S, and S Proof for the District of Columbia, Puerto Rico, Guam, and American Samoa. Page 7 holds the P, D, S, and S Proof for the U.S. Virgin Islands and Northern Mariana Islands. Includes ports for "P" and "D" issues. Series and individual state information included. * D.C. and Territories Update Page 6 for Littleton State Quarters 1999-2008 P&D Album LCA48. 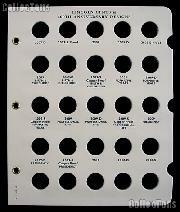 This update page holds the P and D mints for the 2009 District of Columbia, Puerto Rico, Guam, U.S. Virgin Islands and Northern Mariana Islands Quarters. Includes ports for the 1917 relocated obverse and reverse mint marks. Series information and mintage figures included. Include ports for Proof and variety issues. Series information and mintage figures included. Includes ports for Proof, Bicentennial and variety issues. Series information and mintage figures included. Includes ports for Proofs and variety issues. Series information and mintage figures included. Includes 2 blank pages. Includes ports for Proofs and variety issues. Series information and mintage figures included. Includes ports for variety issues. Series information and mintage figures included. Series information and mintage figures included. Includes ports for variety and Proof issues. Series information and mintage figures included. Labeled to 2006, includes 6 blank ports. Series information and mintage figures included. Labeled to 2006. Includes 11 blank ports. Series information and mintage figures included. Labeled to 2016. Includes 4 blank ports. Series information and mintage figures included. Labeled to 2016. Includes 11 blank ports. Series information and mintage figures included. Major U.S. coin types from 1796 through 2000. Photographs and historical references. 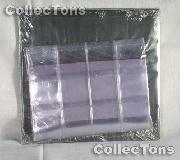 This album includes 15 mylar pages with 9 pockets on each page to hold your coins in holders. 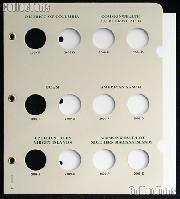 There are also 15 manila colored pages to insert behind the mylar pages to allow for labeling the coins in your collection. 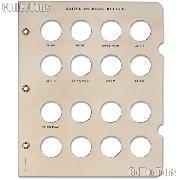 Separate Mylar holders and inserts are also included for added protection of each coin. Labeled to 2014. Series Information and mintage figures included. Labeled to 2010 with 6 blank ports. Includes information about the Kookaburra bird. Features two countries per page - eight slots per country. Brief history of the Euro included, as are illustrations of each countries reverse design. 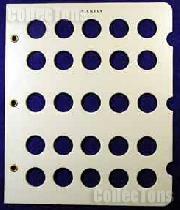 This album contains 21 clear pages with 6 pockets on each page to hold your coins in holders. Manila pages separate the clear pages with information on each emperor printed in the space behind the space to store the coin. The manila sheet is also tabbed with the date range of the coins on the preceding clear page. An alphabetical index page in the front of the album lists the emperor, rule, and page in which his coin is stored for quick, easy reference. Littleton blank binders are used to assemble your own unique Littleton album by adding pages of your choice to these binders. Littleton albums are acid-free and PVC-free to provide archival-quality, long-term storage of your coins. 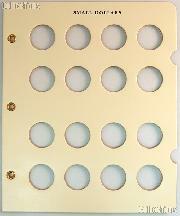 The sturdy 3-ring binder holds the pages in place. Holds up to six pages and two Corrosion Protection Pages. Littleton blank pages are used to supplement your existing Littleton albums or assemble your own unique Littleton album by adding these pages to blank binders. 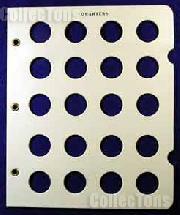 Clear plastic slides within each page ensure secure storage and allow for easy viewing of both sides the coin. Littleton albums have always been a good way to store your coins. Now you can enhance their protection with Littleton's archival-quality Corrosion Protection kit. Anti-corrosion pages are made from Coroplast CI TM, which is scientifically proven to neutralize harmful gases in the air which can cause corrosion - with no harmful agents or chemicals. The custom slipcase reduces the flow of circulating air. Just add two powerful inserts and the custom slipcase to your existing Littleton album and give your coins the extra defense they'll need! The state-of-the-art technology will preserve your coins in their current state for up to 15 years! Made in USA. Littleton's custom slipcases reduce the flow of circulating air, increasing protection of your coins. Just add the slipcase to your existing Littleton album! A slipcase also provides a handsome, sleek look to your Littleton albums. 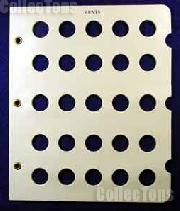 For the added benefit of protection against corrosion, it is recommended that you add two anti-corrosion pages, which are available in a separate listing. The Littleton protection kit which includes the slipcase and protection pages is also available in our listings. Littleton portfolio albums are acid-free and PVC-free to provide archival-quality, long-term storage of your coins. Each album features a 3-ring binder with clear pages to store the coin holders and black divider sheets for enhanced display. Made in U.S.A. 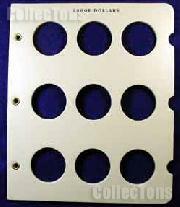 Designed to hold 6-pocket clear pages for slabs or 16-pocket clear pages for 2x2's. This album contains 10 clear pages, each containing 16 clear pockets to protect and display 160 of your coins. Each order includes 160 vinyl holders that fit inside the 2" x 2" pockets, black divider sheets, blank story cards, and a custom slipcase. 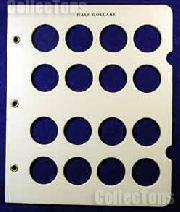 This certified coin portfolio contains 4 pages and holds 24 coins in PCGS, ICG, NGC or ANACS holders.